What are the miracles that a body pillow will do for you? 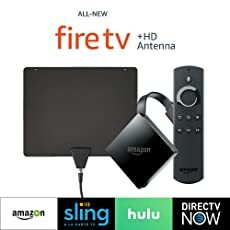 What should you look for, which one is the best and how to choose it? 2 How to choose the best body pillow for you? 3 What about the material and the filling of the pillow? Sure, it might not sound important, but you will completely change your opinion when you wake up in the morning with a stiff, painful neck. By supporting your neck properly, the body pillow prevents you from having any discomfort in the morning and ensures a restful, satisfying sleep and a great morning! You spend almost half of your day sleeping, so it is vital for your health to make sure that your spine is well supported and in a natural position. This becomes even more important when you are pregnant, as your changing body can put more pressure than usual on your spine. With a regular pillow it is quite difficult to find the right position for your spine, so you put plenty of pressure on it. In short term, this won’t be an issue (although there will be plenty of discomforts), but in long term, you will experience serious back pain and possibly serious associated medical conditions. On the other hand, body pillows take away all the pressure on your spine and maintain your back in a natural, relaxing position for the entire night. Have you ever woke up feeling sore, or with pain in a specific group of muscles? Yes, that’s not fun at all, not to mention that it is also dangerous in long term. A body pillow prevents all this by supporting your body (or a part of it) in a proper way, taking away any strain on your muscles. Your body is changing tremendously in a very short time during pregnancy, and your belly needs to grow to make room for your child. As magic as this is, it can also be very uncomfortable. 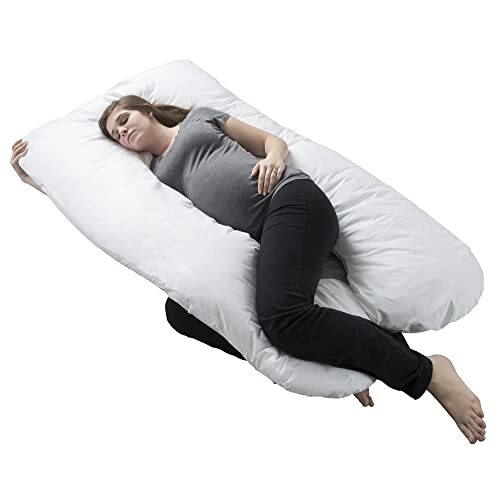 After the first trimester of pregnancy, it is recommended to sleep with the best pregnancy body pillow that will support your belly during sleep. Besides, a full-body pillow will also allow you to sleep on your belly, without actually putting pressure on your belly and causing harm to your baby. When you are sleeping in the wrong position, your muscles are tense for the entire night in order to adjust to your position. Because of this, the blood circulation can be restricted and slowed down in your arms or legs, which leads to discomfort, numbness or pain in short term, and blood circulation problems in long term. With a full-body pillow, it is easier to find a comfortable position to sleep in. There are many people who switch their position and move around the bed for the entire night, and this affects the quality of your sleep so you wake up in the morning feeling more tired than you did the night before. On the other hand, when your body is in a comfortable position you get a full night of uninterrupted sleep! How to choose the best body pillow for you? First of all, you have to detect and understand the problem that you are dealing with. If you are, for example, a side sleeper and you find it difficult to find a comfortable position that does not put too much pressure on your muscles and spine, you need a full-length straight body pillow that will relieve the strain. For the moments when you wake up in the morning with back pain and you feel like your spine and posture are suffering, a C-shaped body pillow is recommended. It is especially helpful if you are pregnant too, as it will allow you to raise one of your legs on the pillow and to support your belly at the same time. Of course, a U-shaped body pillow is maybe the right choice for pregnancy pain and discomfort. It will support your entire body, your belly, and allow you to sleep on your belly without actually putting pressure on it. This will help you eliminate numbness and muscle aches that are associated with pregnancy. What about the material and the filling of the pillow? Naturally, these are also aspects to consider. You wouldn’t want to sleep on a body pillow filled with Styrofoam balls if you are a light sleeper who needs complete silence, as the noise can keep you up the entire night. Sure, Styrofoam balls have the advantage of being cheap, lightweight and comfortable, as it adapts to your body shape. Polyester fiber filling is more common, as the producers can obtain the desired firmness depending on the amount of fiber they use. It does not make any noise and it is suitable for most of the people, regardless what type of sleep they have. 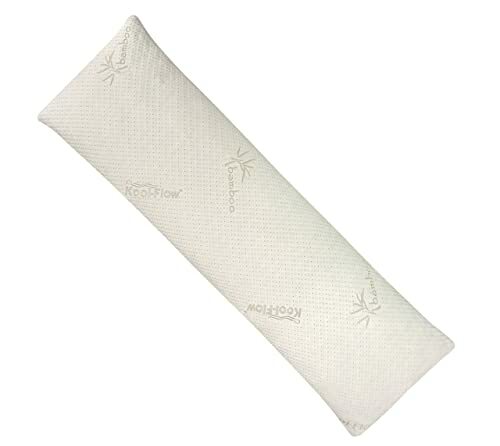 For a noise-free, lightweight and comfortable body pillow, you can choose the micro-bead filling. It feels like sand and it is easy to carry around, so you can move it from your bed for a quick nap on the couch. Memory foam body pillows are quite popular for their properties of adapting to the body shape and regaining their shape when they are not used. However, if they are not made from a high-quality foam that is shredded, they can cause head build-up, and they can be quite uncomfortable during hot summer months. Natural fillings are also available for body pillows, and they vary from spelt, wool to kapok and bamboo. Now that you know the basics and what to look for in your ideal body pillow, we will take a look at some of the best body pillows out there and what they have to offer! With an average price and hypoallergenic cover, the CustomSleeping body pillow is perfect not only for pregnancy but also for side sleepers who need to feel comfortable at night. The cover will prevent dirt build-up and it will not cause allergies or rash, even if you use it for weeks and weeks. It is filled with memory foam and gel fiber, which means that it will adapt to your body and it will get back to its original shape once you stop using it. You will never have to worry that your body pillow will end up with a strange shape after using it for a long time. Thanks to the filling, it is very flexible, so you can use it to support your neck, legs, belly or your entire body. 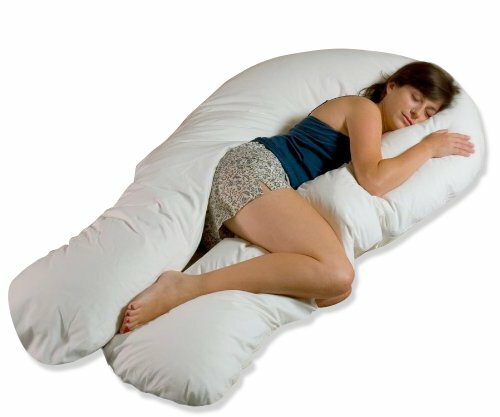 There’s no sleeping position that you can’t reach with this body pillow! Do we like it? Yes, we do! It keeps its shape on the long term. The Aller-Ease Body Pillow is a great choice for people who suffer from back, neck, muscle pain or expecting mothers who have trouble sleeping comfortably at night. 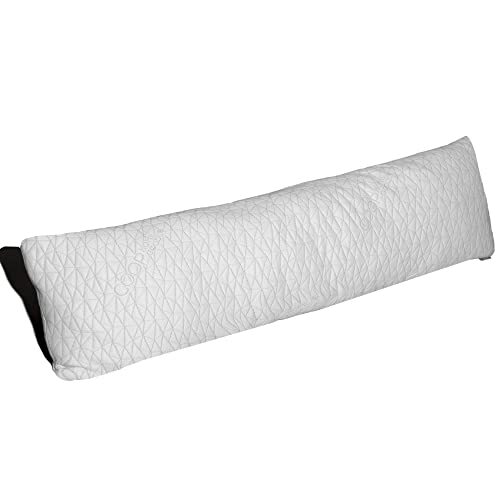 With a hypoallergenic fiber fill and a comfortable cotton cover, this simple, but effective body pillow can be used by anyone, regardless what sleeping position they prefer or if they suffer of allergies or asthma. 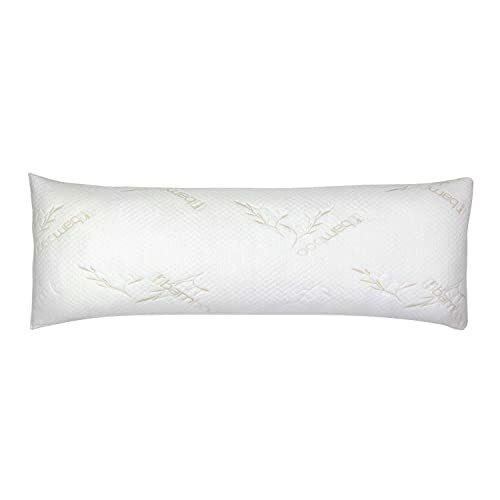 The fiber fill makes it firm and supportive, ideal for people who need more firmness than an average pillow can offer. The materials make it machine washable, which is very good for people who don’t have a lot of time to manually wash and dry their bedding. Pregnancy pillows are a must for any expecting mother, as they can turn a sleepless night and muscle aches into a restful, comfortable, healthy sleep. 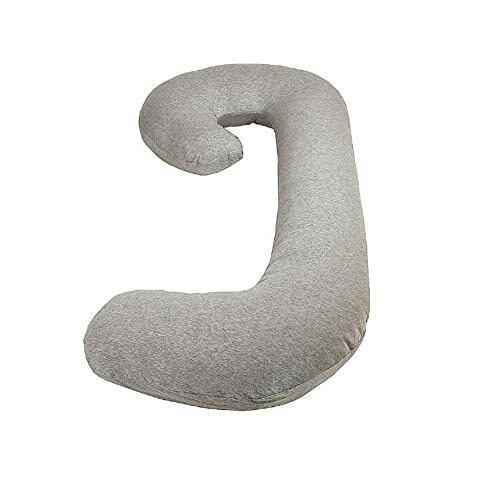 This U-shaped body pillow is hypoallergenic, which means it will not cause allergies or trigger asthma. The filling is Bionic Polyethylene, therefore the pillow is firm enough to support your entire body if you are a side sleeper, but moldable enough to support your belly or get twisted in any way you like. You want to get rid of back or neck pain during sleeping? Then Queen Rose body pillow is the perfect sleeping accessory! The special filling of the pillow also means that it’s machine washable, saving you a lot of time and effort. The cotton cover of the pillow has a zipper, so you can wash it whenever you want without having to get all the pillow wet for this. It’s made to be comfortable to use, and comfortable to sleep on! This full-size, U-shaped body pillow promises to be everything an expecting mother (and not only!) can dream of! 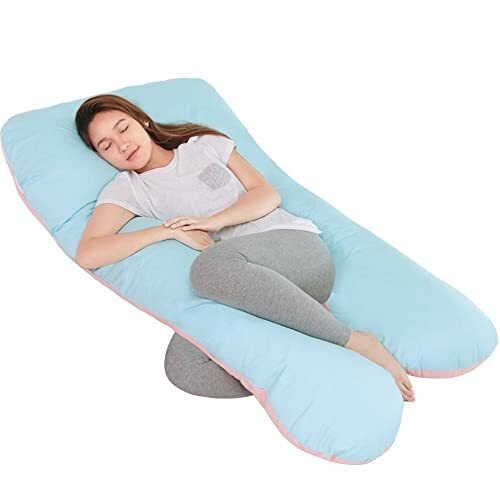 It is large enough to support the entire body, regardless if you want to sleep on your back, side or belly, and firm enough to support every part of your body, from your head to your feet. Although it comes at a slightly higher price than other similar items, the Moonlight body pillow is designed to provide full comfort. It is filled with premium Synthetic Down and this makes it hypoallergenic, odorless and machine washable, so perfect for any bedroom! Because Synthetic Down is a breathable material, this pillow can also be used during hot summer months, because it will help you keep cool throughout the night. If you are one of the people who can’t handle feeling hot at night, this Snuggle Pedic pillow is for you! It is made from Viscose of Bamboo, Polyester and Lycra. The advantage of this unique blend of materials plus the Micr-Vented Cover is that it is completely breathable and it will never make you feel hot, regardless of the temperature in your bedroom. Apart from this, it will never become flat, no matter how or for how long you use the pillow. The firmness of Snuggle Pedic pillow allows you to use it as a regular pillow, or to support your back, knees, or your entire body if you are a side sleeper. Firm enough to support your spine and neck, but soft enough to hug when you want to sleep on your side! It is versatile and suitable for anyone, including expecting mothers. Because of its length, it can also be used as a common pillow for you and your partner! With an average price but special design, the Restorology pillow promises to be any expecting mother’s best friend. It is specially designed to match the shape of the body and provide full support. 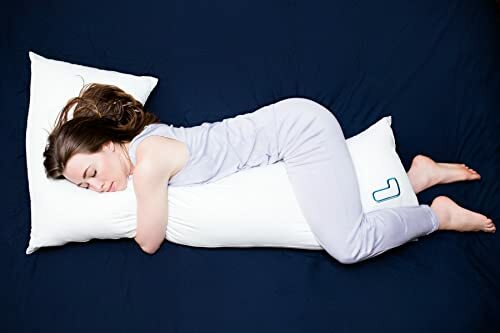 Regardless if you are sleeping on your back, on your side or on your belly, you can count on this body pillow to give you the best sleep you can have. Of course, it’s not uncommon to feel the need to hug someone (or something?) during sleeping. While hugging your partner might be a temporary solution, it is not the most comfortable thing to do during long, hot, summer nights. On the other hand, you can easily sleep hugging the Restorology body pillow without feeling hot throughout the night! Because hygiene is very important especially for expecting moms, the cover of the pillow is easily removable thanks to the zipper, so you can simply toss it in the washing machine and then in the dryer. No need to worry about washing and drying a large, heavy pillow! The Coop Home Goods body pillow is meant to offer incredible support and comfort during the night, not only for expecting mothers but for everyone else. Because it is made from Memory Foam, it is extremely versatile and it can be used for complete body support, or for the neck, back or feet support alone. Regardless, it will relieve muscle pressure and it will prevent numbness and pain during sleeping. The material is hypoallergenic, so it is suitable including for those who suffer from allergies and asthma. At the same time, it is machine washable so it is easy to clean and dry. Although firm, it adapts easily to your body shape and it will regain its original shape once you stop using it. Lightweight enough to carry it around the house, it will be your best support when you are reading a book in bed or watching a movie on the Sofa. Besides, you can also use it when your baby arrives as a breastfeeding pillow, or simply for back support when you spend time with your precious one! Considered to be one of the best full-body pillows for side sleepers, the snuggL Pillow will definitely satisfy your sleeping habits. Perfect for hugging at night, it will help you have a restful sleep without any pain or discomfort. The shape allows it to support your spine in a natural position, eliminating not only pain but also possible spine conditions in long term. At the same time, it is great for side sleepers, because it relieves the pressure that they usually put on the side that they’re sleeping on. This means no more numbness, no more pain, no more stiff joints in the morning! With medium firmness and Micro Gel Fibers filling, the snuggL pillow is extremely versatile, and it will be completely comfortable both during winter and summer. The hypoallergenic cover will keep the dust and dust mites away, and it is easy to wash in the washing machine. 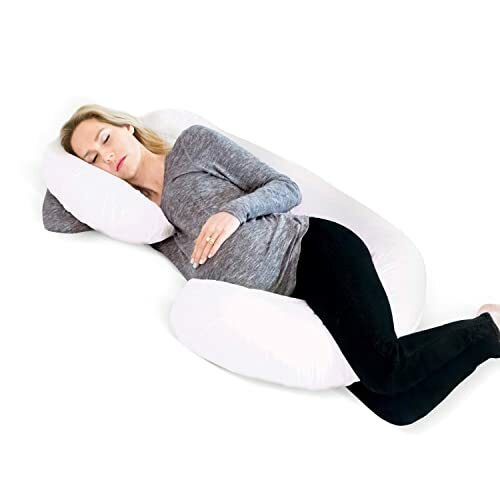 For expecting mothers, this pillow has the perfect L-shape; it’s extremely easy to get a good night sleep while supporting your belly (and entire body if needed!) on this pillow. 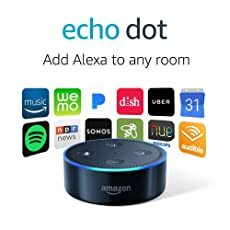 If you are wondering if all its promises are true, give it a try! This C-shaped, extra-long pillow is the one pillow that you need to rule them all! Because of its shape and length, it can easily replace all the other pillows that you usually have in your bed. Yes, you can finally have all that space back and enjoy a good night sleep! The shape of the Leachco pillow makes it perfect for everyone, as it can support an expecting mother’s belly, or anyone else’s front, back, side, neck or feet! Bend it in whatever way you want to rest every part of your body and stop putting pressure on your muscles and spine! Although quite large, it is lightweight enough to be able to move it around the house, so you can be comfortable wherever you want to stay. Also, it is machine washable which makes it extremely easy to clean at any given time. Apart from all this, the pillow will not make you feel hot in the summer or cold in the winter; the breathable material allows the air to pass, so the pillow will have the perfect temperature every single time. During pregnancy, it is important to make sure you get plenty of rest and the best possible sleep. Since your body is going through major changes, a maternity pillow might be exactly what you need to prevent pain and discomfort and to avoid waking up at night. This U-shaped, oversized pillow can replace all the other pillows you have in your bed and can be the only bedding accessory you use. It is large enough to support your entire body at once, regardless if you are a side or back sleeper. If you still want to sleep on your belly although it is more difficult now, the pillow can help you with this too! It will absorb the pressure that would normally be on your belly and keep your comfortable and healthy. 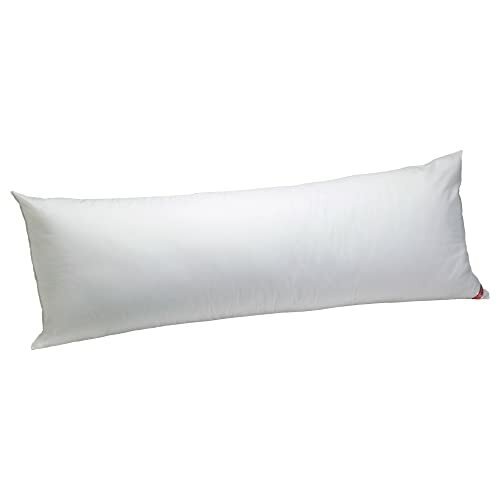 The pillow is filled with Polyester Hollow Fiber and it comes with a hypoallergenic, removable cotton cover. It is also washing machine friendly! The great advantage of this? You can use it as a nursing pillow after your baby arrives, and it will definitely prove to be a great help in the first weeks after delivery! Are all these body pillows good for you? Not necessarily! Find out more about each one of them and analyze your needs, the way you sleep and what you need to change in order to be well-rested. Invest in the best body pillow that will transform your sleep without any effort from your side! I have the Sea to Summit Aeros pillow and love it. The stuff sack pillow thing has never worked for me. No matter how hard I try, it is always lumpy and annoying. My Sea to Summit pillow is a permanent piece of gear for me that is always stuffed in with my sleeping bag so that I never forget it. Plus 1 for Snuggle-Pedic Memory Foam Body Pillow, it provides a whopping 20-year product warranty, it gives proper relaxation during sleeping, loved it.